For many homeowners, the look and feel of an open floor plan are extremely desirable. Watch any of the million home improvement shows on television and you will see for yourself as flippers, renovators, and DIY, weekend warriors rip down internal walls to open kitchen and dining rooms or connect separate living areas. Each week, cohosts prepare for demo day and take sledgehammers to drywall with a nonchalance more appropriate for a paint project. This happens so often that as prospective homebuyers and fans of these shows walk through showings they are already thinking about the walls they would take down to improve feng shui. What many fail to realize though, is that walls are not merely impermanent design elements meant simply to close off space. Many times, they are structural and part of a very complex engineering system the bears the weight of the entire house from roof to foundation. I know what you’re thinking: that’s all good and well, but I still want my open floor plan. Fear not! There are plenty of solutions that allow for removing internal walls, even if they are structural. That said, it is of primary importance that you know exactly what you’re getting into before you take on such a job. So how exactly do you find out if a wall that you desperately want to say goodbye to is load bearing? There are a few ways outside of calling an expert. You will find these, along with video aids, as outlined below. 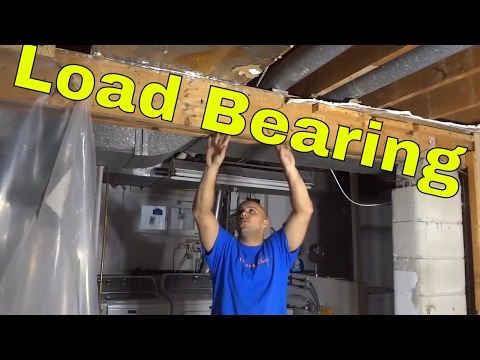 But first, what is a load bearing wall? Before you can begin to understand how it is that you will tell if a wall is load bearing, it is first necessary to get a sense of what a structural wall is and how it fits into the grand engineering scheme of your home. A load-bearing wall, in the most simplistic sense, carries the weight of the house above it. More accurately, it is one of many structures in place throughout your home that absorbs weight from above and transfers it below. All of your home’s exterior walls are load bearing. Then, there will also likely be a few internal walls that are involved in the structural integrity of the house so that less weight is placed solely on the exterior boundaries. Internal load bearing walls are the tricky ones to determine. Once you find one, however, it will typically be mimicked floor to floor meaning if there is a wall on the second floor that is directly above one on the first floor, there is a good chance that both bear some weight. In homes where additions have been built, there may be some internal walls that do not fit the criteria of a load bearing wall that we will later discuss. However, keep in mind that what is now internal walls may have once been exterior walls, and so they certainly bear weight. Another consideration to make concerns beams. While some are decorative, if you have a beam running across a ceiling or threshold in your house, it is because it bears weight. In recent years, the aesthetic of the beam has become extremely popular, but really this was a happy accident. In serving to achieve open floor plans for their clients, contractors would have had to do something to keep houses standing. That is where beams came into play. Unfortunately, the wall itself will not give itself away as load bearing. To find this out, you will have to embark on a bit of a scavenger hunt. A good place to start is the basement. In the basement, you will find beams much like the decorative exposed ones mentioned above, except less fancy. These beams will run directly into the foundation at either end of the house. They may also be supported by concrete posts or concrete filled pole structures. Yes, that is the reason for those arbitrary seeming poles in your basement. On these beams rests the weight of the house. The beams transfer this weight into even sturdier structures like the foundation, concrete posts, and poles. If the wall you are hoping to remove is directly above one of these beams, your wall is probably load-bearing, as well as any wall directly above that one. Finding out that a wall is directly over a beam is the biggest tell that it is load bearing. Things get slightly more complicated for walls that are not directly over beams. Next, you can look at the joists for further evidence. Joists are the boards that run perpendicular to the beams. You will notice that these do not face to face with the beams but are rather turned on edge. The purpose of the joists is to support the floor above it. So, we know that walls directly over beams will be load bearing. We also know that walls not directly over beams that run perpendicular to joists MAY be load bearing. But how do we tell for sure? To find out for certain we have to head up to the attic to see what needs supporting and where weight is distributed. 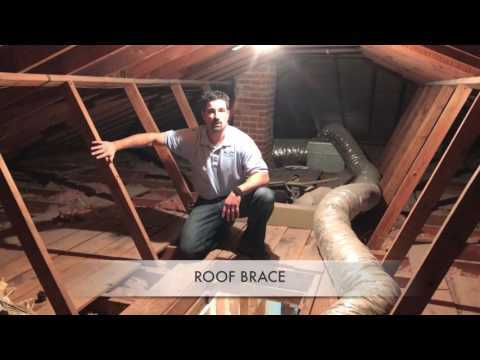 From the attic, find a landmark by looking again for joists. The walls in question will again run perpendicularly below those joists. It is also more likely that internal load bearing walls are positioned near the center of the house. This is because these are the farthest from the exterior walls so the distribution of weight is evener. Once you have identified the walls that run perpendicular below ceiling joists, look for what sits atop. In the attic, there will be roof rafters, boards positioned at the same pitch of the roof, which support its weight. Those rafters will be braced by boards running at the opposite pitch. The point where the brace boards meet the floor of the attic bears load. If your wall runs directly below this point, it is load bearing. Subsequently, a wall on the first floor the mimics this one is also structural. There is one other scenario that would provide a very clear indication that a wall is structural without forcing you to trek all over the house. In some homes, you can find wall ends that are cased in large decorative moldings or openings with partial sections of drywall at the top. These features are most likely concealing a structural support. At a wall end, it would be a post and at the top of an opening, a beam-like one you would find in your basement that is not exposed. The walls that these features are a part of will be load bearing. It is important to reiterate that if only one of the above is true, there is still a chance the wall is not structural. You must clarify a walls integrity as it pertains to the larger structure of the house. The only way to do so, much like the construction of the house itself, is from the ground up. Only then can you be certain that your open floor plan is a viable possibility.